Welcome to the website for the immigration law firm Robert J. Jacobs Immigration Law, PLLC. Robert J. Jacobs, Esq. has been providing immigration legal services and immigration law in Gainesville, Florida, Ocala and North Central Florida region since 1997. During the past 20 years, he has helped immigrants from all over the world become permanent residents or citizens of the United States. 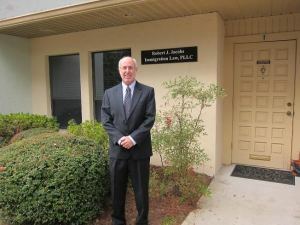 His clients include international scientists who apply for permanent residence under the national interest waiver; professional jockeys who require P-1 visas or green cards; engineers and other professionals who require H-1B visas or green cards; and U.S. citizens or residents who have married foreign individuals and wish to secure them permanent residence in the U.S.
Mr. Jacobs is available to assist those immigrants needing assistance for any matter in immigration law. He is also available to provide guidance due to the unprecedented harsh policies of our current government. Please call him at 352-359-3910 or send a message to set up a consultation.